The proven standard for truck mount spreaders, BBI spreaders are the most efficient, accurate and reliable spreaders available today. BBI spreaders are built using only heavy duty, high-strength materials for long lasting durability. Hopper beds are constructed from 10 gauge sheet steel. BBI Hydraulic Truck Mount Endurance spreaders come equipped with the BBI Binary valve and are ready for ISOBUS compatible electronics. Our "Accu-flow" pattern divider, an exclusive design feature on BBI litter spreaders, assures uniform material delivery to the spinners, for improved material distribution. 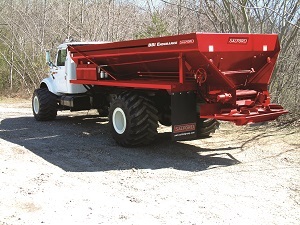 BBI Binary Manifold is STANDARD on all Endurance Hydraulic Spreaders. The BBI Binary Manifold facilitates QUICK installation of all Precision Agriculture Tools. Extensive use of UHMW reduces corrosion issues and extends the life of the spreader. UHMW Poly Floor lasts the lifetime of the spreader. The drag coefficient is less than steel. Hydraulics run cooler and last longer with less stress on the system. Floor chain, motors and gear cases last longer. 1/4� Fin - 33% thicker than traditional design. Innovative Spinner Motor eliminates motor failure at the pressure seal. HD Two-Section Pumps run cooler and last longer. Fuel and time to apply is reduced by 50%.